After a successful summer period which yielded 4 wins and a city 2nd our small team are all back in work after spells and freshen ups. The team is now fully settled into their new home at Facey Road and it is virtually a full house with room for 1 or 2 more. It is a great environment for horses with lovely big yards with shelters in a peaceful location, the horses are really thriving. Here is an update on the team. Banksy Strikes showed good promise in his 3 runs through March and will be in the winners circle sooner rather than later. He is a big raw horse that will continue to develop with each preparation as he learns his craft in this his first preparation. Cyclone Tim back from a freshen up after some good performances over the summer. He will be up and racing soon to take advantage of the wetter tracks over winter. With experience and maturity on his side now looking forward to him working through his classes. Empire Liberty another that returned from a freshen after putting 3 wins on the board over a summer. 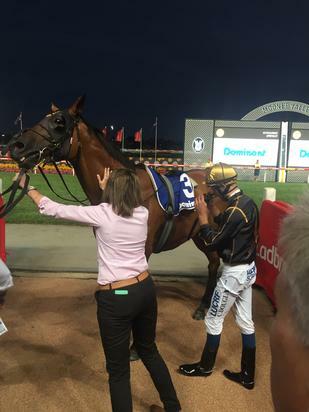 He needed the run the other night at Pakenham and that blow out will have him ready to possibly have a crack at a VOBIS gold race in the coming weeks. The Old boy Plot The Course also returned from a freshen up. He was run off his feet at Caulfield over an unsuitable trip he will be much more competitive next time out where he will strip fitter and be better over 1600m. Of the unraced we have a lovely 2 year old filly about a month off trialling. A premier sale purchase by Turffontein out of the St Leger winner Inkster she has shown plenty of promise so far. Hopes are that she will be there come spring time in the 3 year old filly staying races. Our Moshe filly showed good speed in her jumpouts during her first preparation she looks a sharp running filly and has strengthened up significantly during her break. The talented Reconciled has again been forced onto the sidelines due to injury. We have not had much luck with her but will keep persisting as she has shown tremendous ability and will win races if we can get her to the track and sound. New to the stable Rubme is close to resuming. A 5 time winner his recent jumpout suggests that he has come back in good form and is in for a good campaign. Trotter racing will be attending the upcoming Inglis Gold sale and will be looking to add 1 or 2 yearlings to our stable please contact us if you would like to be involved in any of our new purchases.